Forum > General Stuff > Behind The Stage > Marionette Tips? Hello, everyone! I haven't been on in a while, but I recently had a good find in an antique shop! 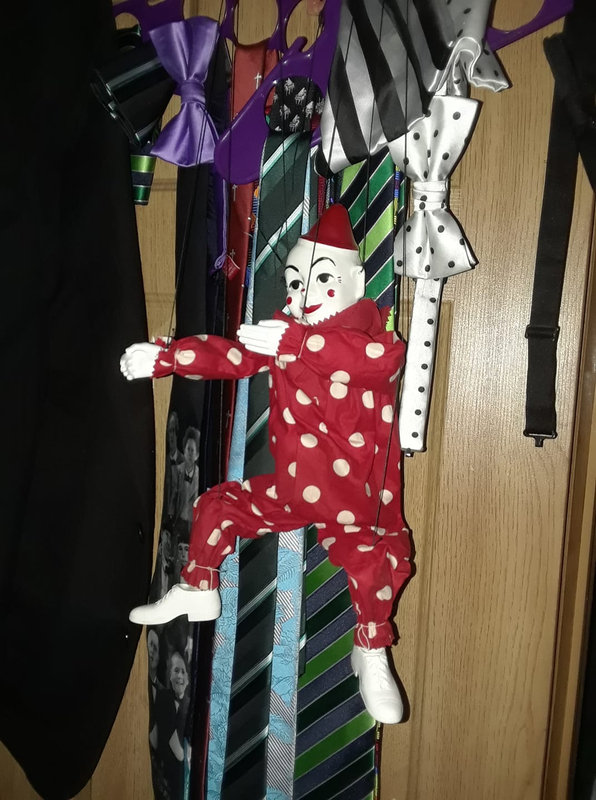 I found a wonderful (but creepy) clown marionette! I purchased it mostly because I want to learn how to properly puppeteer on marionettes. Does anyone have any good tips or videos? This marionette is also a super simple one. It's not even complex enough to have two separate bars for arms and legs. The controls have one bar with the legs and arms on them and then a regular bar that has the head and the back. well as creepy looking as it is, the first suggestion I would give is not watch any of the Puppet Master movies. My suggestion would be to simply put on some music and 'play' with the puppet. A small amount of movement in the control can actually cause quite a bit of movement in the puppet. If you want more control you can build a new control for him to separate the hands from the legs. You can see a basic controller here http://puppetsandstuff.com/community/index.php?action=gallery&g2_itemId=22913 you don't need the shoulder or nose attachments on this puppet but you could string the others. Stringing Tip: Start stringing your puppet from the puppet up. That way you can leave extra string at the control so that if you need to lengthen some you can untie the knot then retie. Once you test it all out and the marionette moves how you want then you can cut the extra off and secure the knot with a bit of glue. The hand bar is not detachable ? so it's a continuous string ? How do you use the elbow string ? Yes the hand bar is a run through. Gives some movement just by tilting the control and then if you want to raise one hand you can either pull up on the string for it or simply pull down on the opposite string. You can string through a bead on the top of the control that makes it easy to grab and raise both arms. If you already have the puppet strung then take a small tap of felt and wrap around the string and glue the tip so the string can still pass easily through. Now you have a tab you can pull just like the bead. I actually did this often instead of the bead simply because I found it a bit easier. Elbow strings do two things. One they can help with the balance of a puppet and two the give a slight natural bend to the arms when the marionette is standing still. If you think about it most people keep there elbows slightly bent at all times. It also gives you one more movement you can use for your puppet.